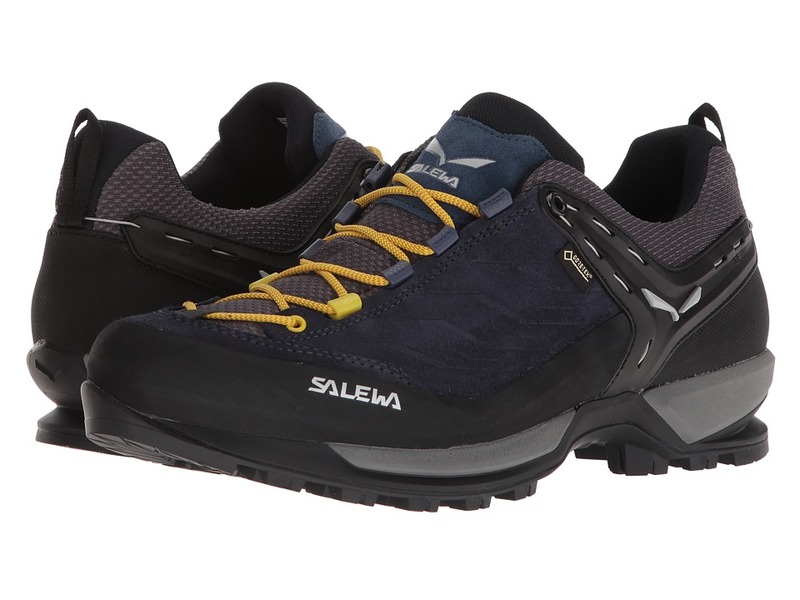 The Mountain Trainer GTX hiking shoe from Salewa provides excellent durability, waterproof protection, comfort and grip when you are on and off the mountain. Resistant suede upper featuring a protective climbing rubber rand. Waterproof GORE-TEX Extended Comfort lining offers a comfortable feel, better breathability, and keeps out the wet elements. 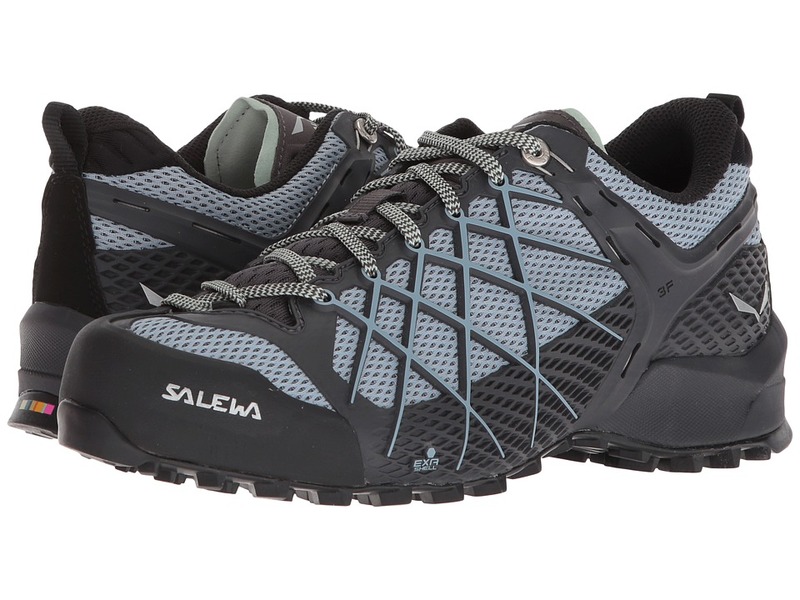 The SALEWA Y design connects to the 3D lacing system and spreads the lacing force onto the whole foot, allowing for easier control of the heel movement. Climbing lacing system provides a more accurate lacing in the toe area, which gives more support and allows for better performance. Customizable MMF Multi-Fit Footbed is a three-dimensional body defined by length, width, and height, allowing even adjustability for an individual fit. NXT Odor Control features 100 percent fresh silver that reduces bacteria that causes odors. Treating the shoes with silver ions destroys enzymes within the bacteria that are necessary for them to live, allowing for a fresher, odor-free foot environment. Durable Vibram Alpine Approach outsole provides incredible stability and grip on various terrain. Imported. Measurements: Weight: 1 lb 2 oz Product measurements were taken using size 10.5, width M. Please note that measurements may vary by size. Weight of footwear is based on a single item, not a pair. The Mountain Trainer from Salewa provides excellent durability, comfort and grip when you are on and off the mountain. Resistant suede upper featuring a protective climbing rubber rand. 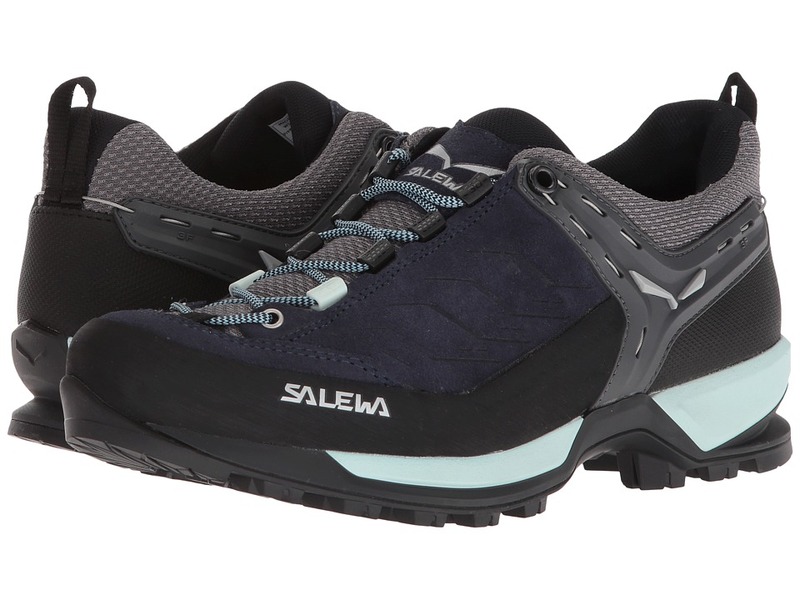 The SALEWA Y design connects to the 3D lacing system and spreads the lacing force onto the whole foot, allowing for easier control of the heel movement. Climbing lacing system provides a more accurate lacing in the toe area, which gives more support and allows for better performance. Customizable MMF Multi-Fit Footbed is a three-dimensional body defined by length, width, and height, allowing even adjustability for an individual fit. NXT Odor Control features 100 percent fresh silver that reduces bacteria that causes odors. Treating the shoes with silver ions destroys enzymes within the bacteria that are necessary for them to live, allowing for a fresher, odor-free foot environment. Durable Vibram Alpine Approach outsole provides incredible stability and grip on various terrain. Imported. Measurements: Heel Height: 1 in Weight: 1 lb 3 oz Product measurements were taken using size 11, width M. Please note that measurements may vary by size. Weight of footwear is based on a single item, not a pair. 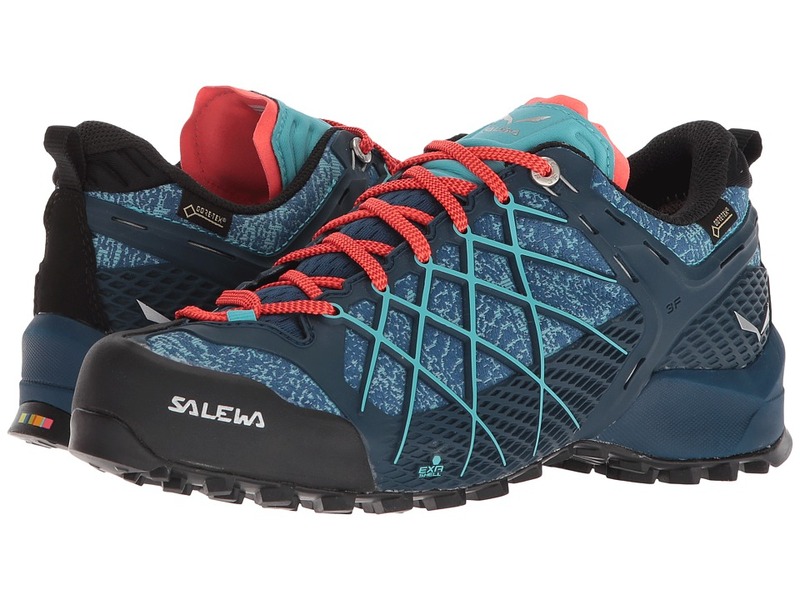 The Salewa Wildfire GTX climbing shoe has a lightweight construction, comfortable anatomical last, and a perfect aggressive outsole design that makes it the ideal choice for approach. Anatomical last allows for a precise, comfortable fit. Ballistic mesh upper reinforced with the unique EXA shell technology for lightness and durability. Features the 3F SYSTEM EVO design for superior flexibility, ankle support, and precision in fit. Waterproof GORE-TEX lining allows for better breathability and keeps out the wet elements. Climbing lacing system provides a more accurate lacing in the toe area, which gives more support and allows for better performance. Customizable MFF+ footbed is the next generation of multifit footbed technology. It allows for even adjustability for the Wildfire footwear, so you always get a perfect fit. NXT Odor Control features 100 percent fresh silver that reduces bacteria that causes odors. Treating the shoes with silver ions destroys enzymes within the bacteria that are necessary for them to live, allowing for a fresher, odor-free foot environment. Durable Vibram Tech Approach EVO sole provides unbeatable climbing and edging on the most technical approach trails. Imported. Measurements: Heel Height: 1 1 2 in Weight: 1 lb Product measurements were taken using size 10, width M. Please note that measurements may vary by size. Weight of footwear is based on a single item, not a pair. 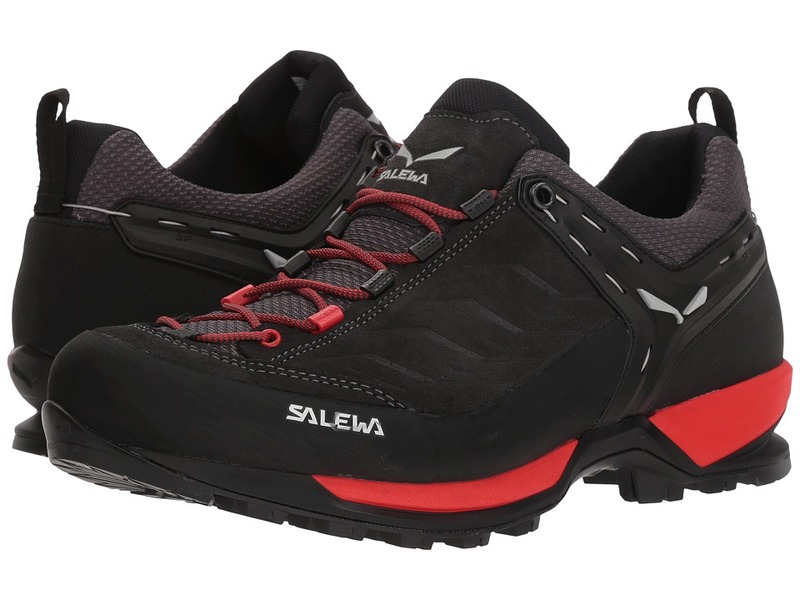 The Salewa Wildfire climbing shoe has a lightweight construction, comfortable anatomical last, and a perfect aggressive outsole design that makes it the ideal choice for approach. Anatomical last allows for a precise, comfortable fit. Ballistic mesh upper reinforced with the unique EXA shell technology for lightness and durability. Features the 3F SYSTEM EVO design for superior flexibility, ankle support, and precision in fit. Climbing lacing system provides a more accurate lacing in the toe area, which gives more support and allows for better performance. Customizable MFF+ footbed is the next generation of multifit footbed technology. It allows for even adjustability for the Wildfire footwear, so you always get a perfect fit. NXT Odor Control features 100 percent fresh silver that reduces bacteria that causes odors. Treating the shoes with silver ions destroys enzymes within the bacteria that are necessary for them to live, allowing for a fresher, odor-free foot environment. Durable Vibram Tech Approach EVO sole provides unbeatable climbing and edging on the most technical approach trails. Imported. Measurements: Weight: 1 lb Product measurements were taken using size 11, width M. Please note that measurements may vary by size. Weight of footwear is based on a single item, not a pair. 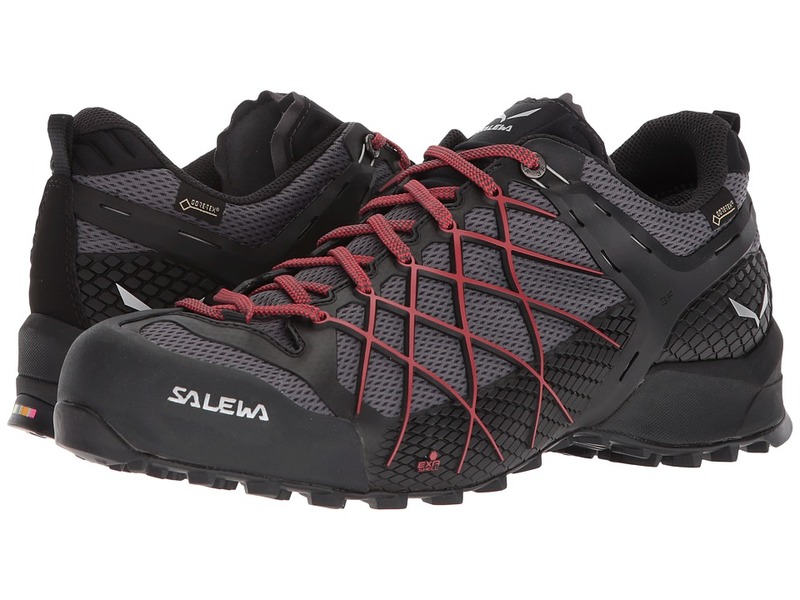 SALEWA makes the ascent with the Mountain Trainer GTX to ensure your next adventure isn~t rocky. Resistant suede upper featuring a protective climbing rubber rand. Waterproof GORE-TEX Extended Comfort lining offers a comfortable feel, better breathability, and keeps out the wet elements. 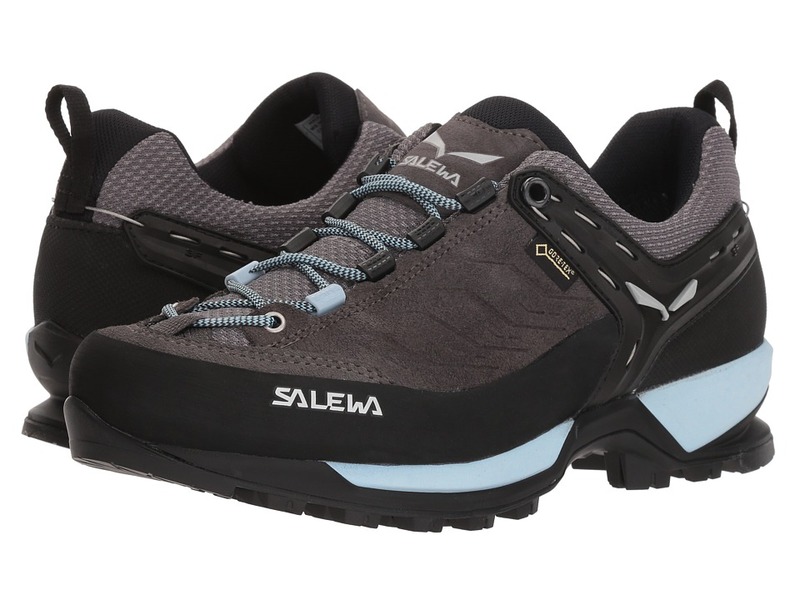 The SALEWA Y design connects to the 3D lacing system and spreads the lacing force onto the whole foot, allowing for easier control of the heel movement. Climbing lacing system provides a more accurate lacing in the toe area, which gives more support and allows for better performance. Customizable MMF Multi-Fit Footbed is a three-dimensional body defined by length, width, and height, allowing even adjustability for an individual fit. NXT Odor Control features 100 percent fresh silver that reduces bacteria that causes odors. Treating the shoes with silver ions destroys enzymes within the bacteria that are necessary for them to live, allowing for a fresher, odor-free foot environment. Durable Vibram Alpine Approach outsole provides incredible stability and grip on various terrain. Imported. Measurements: Weight: 1 lb Product measurements were taken using size 7.5, width M. Please note that measurements may vary by size. Weight of footwear is based on a single item, not a pair. 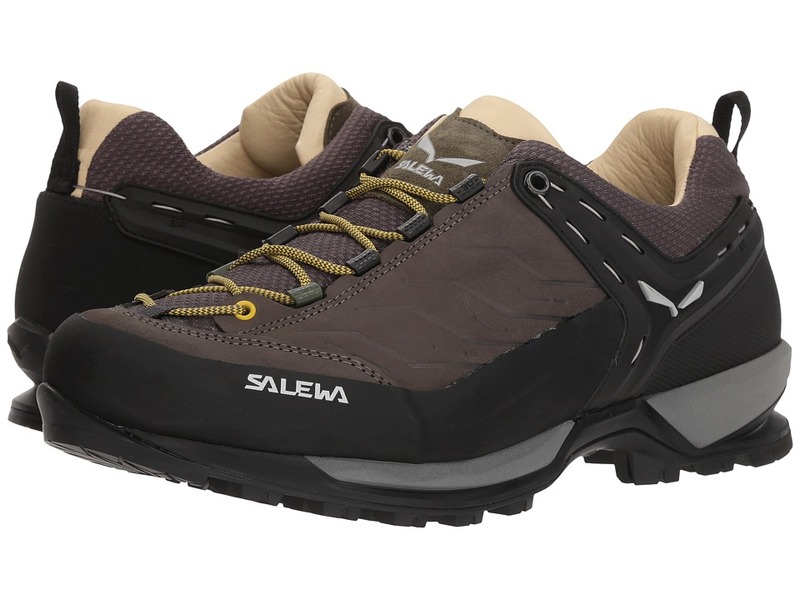 The Mountain Trainer from Salewa provides excellent durability, comfort and grip when you are on and off the mountain. 1.8 mm nubuck leather, 1.6 mm suede leather, tough Cordura nylon, and water-resistant fabric upper featuring a protective 360&amp#176 climbing rubber rand. Features the 3F SYSTEM design for superior flexibility, ankle support, and precision in fit. Breathable mesh lining. Climbing lacing system provides a more accurate lacing in the toe area, which gives more support and allows for better performance. Features Cleansport NXT technology for odor control. Customizable MMF Multi-Fit Footbed is a three-dimensional body defined by length, width, and height, allowing even adjustability for an individual fit. Durable Vibram Alpine Approach and Mulaz outsole provides incredible stability and grip on various terrain. Imported. Measurements: Weight: 1 lb 2 oz Product measurements were taken using size 11, width M. Please note that measurements may vary by size. Weight of footwear is based on a single item, not a pair. SALEWA lets you make your approach with best-in-class weather protection thanks to the Wildfire GTX climbing shoe. Anatomical last allows for a precise, comfortable fit. Ballistic mesh upper reinforced with the unique EXA shell technology for lightness and durability. Features the 3F SYSTEM EVO design for superior flexibility, ankle support, and precision in fit. Waterproof GORE-TEX lining allows for better breathability and keeps out the wet elements. Climbing lacing system provides a more accurate lacing in the toe area, which gives more support and allows for better performance. Customizable MFF+ footbed is the next generation of multifit footbed technology. It allows for even adjustability for the Wildfire footwear, so you always get a perfect fit. NXT Odor Control features 100 percent fresh silver that reduces bacteria that causes odors. Treating the shoes with silver ions destroys enzymes within the bacteria that are necessary for them to live, allowing for a fresher, odor-free foot environment. Durable Vibram Tech Approach EVO sole provides unbeatable climbing and edging on the most technical approach trails. Imported. Measurements: Weight: 12 oz Product measurements were taken using size 8.5, width M. Please note that measurements may vary by size. Weight of footwear is based on a single item, not a pair. From technical mountain approaches and scrambles, to traverses and easy climbs, the SALEWA Wildfire covers wide array of climbing activities. Anatomical last allows for a precise, comfortable fit. Ballistic mesh upper reinforced with the unique EXA shell technology for lightness and durability. Features the 3F SYSTEM EVO design for superior flexibility, ankle support, and precision in fit. Climbing lacing system provides a more accurate lacing in the toe area, which gives more support and allows for better performance. Customizable MFF+ footbed is the next generation of multifit footbed technology. It allows for even adjustability for the Wildfire footwear, so you always get a perfect fit. NXT Odor Control features 100 percent fresh silver that reduces bacteria that causes odors. Treating the shoes with silver ions destroys enzymes within the bacteria that are necessary for them to live, allowing for a fresher, odor-free foot environment. Durable Vibram Tech Approach EVO sole provides unbeatable climbing and edging on the most technical approach trails. Imported. Measurements: Weight: 12 oz Product measurements were taken using size 8, width M. Please note that measurements may vary by size. Weight of footwear is based on a single item, not a pair. Stay safe and steady on the trail with the excellent durability, underfoot comfort, and reliable grip of the Salewa Mountain Trainer L hiking shoes. 1.8 mm nubuck leather, 1.6 mm suede leather, and wear-resistant fabric upper featuring a protective 360&amp#176 climbing rubber rand. Features the 3F SYSTEM design for superior flexibility, ankle support, and precision in fit. Climbing lacing system provides a more accurate lacing in the toe area, which gives more support and allows for better performance. Full grain leather lining for a comfortable next-to-skin feel. Cleansport NXT technology offers organic odor control for a fresher foot environment. Customizable MMF Multi-Fit Footbed is a three-dimensional body defined by length, width, and height, allowing even adjustability for an individual fit. Cushioned PU midsole ensures maximum comfort even over longer distances. Durable Vibram Alpine Approach outsole provides incredible stability and grip on various terrain. Imported. Measurements: Weight: 1 lb 5 oz Product measurements were taken using size 12, width M. Please note that measurements may vary by size. Weight of footwear is based on a single item, not a pair.